The impact factors of scientific journals are interesting but not unproblematic. It is speculated that the number of journals in which citations can be made correlates with the impact factors in any given speciality. Using the Journal Citation Report (JCR) for 1997, a bibliometric analysis was made to assess the correlation between the number of journals available in different fields of clinical medicine and the top impact factor. A detailed study was made of dermatological journals listed in the JCR 1991–2000, to assess the relevance of this general survey. Using the 1997 JCR definitions of speciality journals, a significant linear correlation was found between the number of journals in a given field and the top impact factor of that field (rs = 0.612, p < 0.05). Studying the trend for dermatological journals 1991 to 2000 a similar pattern was found. Significant correlations were also found between total number of journals and mean impact factor (rs = 0.793, p = 0.006), between the total number of journals and the top impact factor (rs = 0.759, p = 0.011) and between the mean and the top impact factor (rs = 0.827, p = 0.003). The observations suggest that the number of journals available predict the top impact factor. For dermatology journals the top and the mean impact factor are predicted. This is in good agreement with theoretical expectations as more journals make more print-space available for more papers containing citations. It is suggested that new journals in dermatology should be encouraged, as this will most likely increase the impact factor of dermatological journals generally. Bibliometric analysis of scientific publications has become an independent area of research, and may with some reservations be used in the analysis of the output from scientifically active institutions and organisations [1–3]. The method is however far from unproblematic, and its validity as a general benchmarking technique is frequently discussed. In particular the question of journal impact factors often finds interest among both authors and publishers. In contrast to the discussions between competing colleagues this topic is also of broader interest in connection with the use of bibliometric analysis in the assessment of e.g. grant applications. Since many specialities compete for a limited number of grants, dermatology as a speciality may therefore legitimately be interested in the impact factors of dermatological journals and any measures, which may be taken to improve their impact factors. The impact factor is calculated by dividing the number of quotations a given journal receives by the number of papers published in a given period of time, and therefore equals the average number of times a paper in the journal is quoted. This may depend on the quality of the paper, but equally on many other factors. One prime factor of importance to specialist topics such as dermatology is the opportunity to quote a given paper. The more special a given topic is, the fewer opportunities exist for quoting it and hence the lower the impact factor. The study was conducted in two steps: a general and a specific dermatological. The ISI Journal Citation Report® (JCR) was used in both. 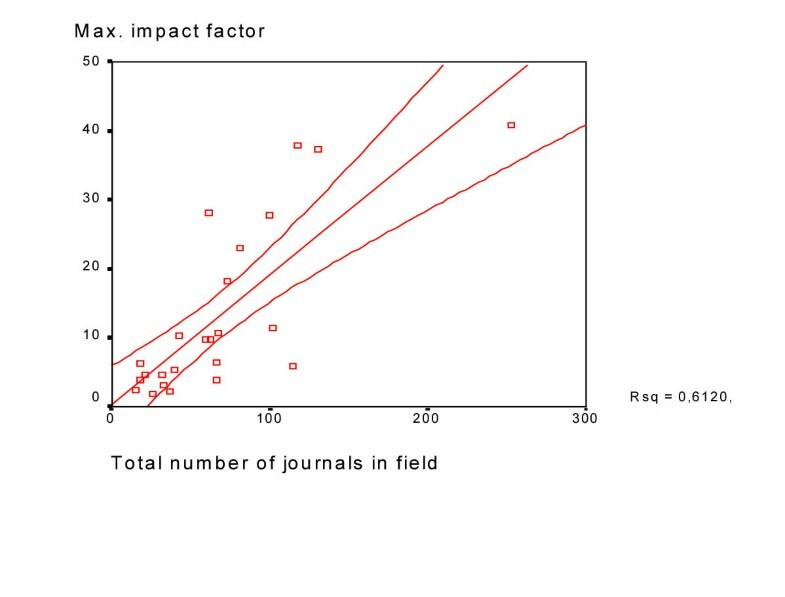 In order to study the general correlation between the number of journals in a given field (as defined by the JCR) and the top impact factor achieved was studied for 1997. In order to assess the relevance of this overall finding for dermatology a further study was conducted of the dermatological journals listed in the JCR for 1991–2000, correlating average impact factor, top impact factor, year and number of journals for all the journals listed in the 2000 edition. Simple descriptive statistics were calculated for individual journals, and non-parametric statistics were used where appropriate. In the assessment of high or low impact and growth trends, low was defined as values below the 95% confidence interval of the mean. Conversely, high was defined as values above the 95% confidence interval of the mean. A value of p < 0.05 was considered significant. The results of the general survey are shown in Table 1. A significant correlation between number of journals and the top impact was also made (p < 0.05), see Fig 1. The figure shows a scatter-plot of top journal impact factor in a given specialist field as a function of the total number of journals in that field as defined by JCR 1997. The maximum impact factor and number of journals in different fields of medicine for 1997. For the period 1991 – 2000 the JCR has included an increasing number of dermatological journals. In 1991 only 27 journals were listed, while in 2000 a total of 36 dermatological journals were listed. In the same period the top impact factor has risen from 3.855 to 4.539, and the mean impact factor for dermatological journals from 1.018 to 1.247, but the difference between the years was not significant. A significant correlation was found between total number of journals and mean impact factor (rs = 0.793, p = 0.006), between the total number of journals and the top impact factor (rs = 0.759 (p = 0.011) and between the mean and the top impact factor (rs = 0.827, p = 0.003). Using multiple regression to study the relationship between the mean impact factor of all the dermatological journals and year-to-year variation and variation in the number of journals a significant relation was found (F = 68.993, p < 0.001). This was due to the number of journals (t = 3.324, p = 0.013) rather than to the year-to-year variation (t = 1.082, not significant). Summary data of trends in impact factor for the period 1991–2000 and the coefficient of variation of impact factors for dermatological journals, are presented in table 2. The trends in journal impact factor in dermatology. There appears to be a general correlation between the number of journals in a given field and the top impact factor achieved. This is in good agreement with logical expectation, i.e. more journals publishing papers on a given topic make more print-space available for more papers containing specific citations. Large specialist areas or general areas of medical science will therefore achieve higher impact factors in purely bibliometric studies . The correlation shows that dermatology journals have an average top impact predicted by their number. In addition a number of other factors play a role one of which may be the scope of a given topic. The word scope can here be understood both as technological (e.g. imunoblotting) or epidemiological (e.g. high-prevalence diseases). This may contribute to the observation that journals in endocrinology, cell biology, immunology, medicine (general) and medicine (experimental) therefore have a higher top impact factor than expected. In contrast areas such as oncology, pathology, paediatrics and surgery have lower maximum impact factors than expected, possibly just due to inherently different technologies. In addition the 'Matthew effect' plays a role in any bibliometric comparison between different fields, i.e. a high number of citeable items will tend to foster high impact factors . The highest impact achieved by a dermatological journal is within the expected range based on the available number of journals in dermatology. Looking specifically at dermatology a similar pattern appears. A larger number of indexed journals correlate significantly with a higher mean and top impact factor. Multiple regression analysis suggests that the number of journals is of greater importance than year-to-year fluctuations in impact factor. Looking at trends for impact factors over the decade differences appear between journals, with some journals having a highly positive trend, e.g. Int J Dermatol, while others have a negative ten-year trend, e.g. Wounds. The coefficient of variation (=SD/mean) for each journal's impact factor has also been calculated as a measure of the stability of the trends. Differences appear to suggest low, average or high variation of impact factor over time. By combining trend and variation it becomes possible to identify different patterns of development, see Table 3. Many factors play a role in this, e.g. the selection of publication type. Some manuscripts are not included in the calculation of the impact factor of a given journal, e.g. letters, although they are in fact quoted, thereby artificially increasing the impact factor . Different development trends for dermatological journals. Specialist topics require specialist journals. If the dermatological society wishes to increase the journal the top and mean impact factor of its journals, one option appears to be to encourage the inclusion of new journals in the relevant indexes, thereby offering authors opportunity for publishing and quoting. It is unlikely that the available publishing space will ever match the ingenuity of the human mind, and a continuous publishing pressure will therefore continue to exist. Some of the published ideas will inevitably be better than other, but nearly all publications will contain citations and hence influence the impact factors of journals.